Add-on for fast communication between game client and Drakkashi's Deck Builder. Compatible with Viper's code format. Decks and profiles are exported as URL links. 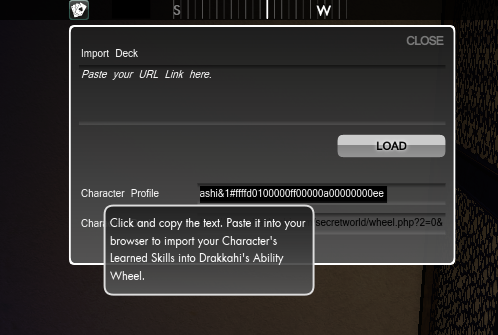 Simply paste the link into your browser to see your deck, or use it to share your deck with others. With a character profile the website can calculate AP cost of the deck you are building, and tell you the position of the abilities you are missing. Unfortunately there isn't. I would have wanted to add more settings for it. But it never became popular enough for me to invest more time in it. Last edited by Drakkashi : 05-29-2014 at 07:28 AM. Thanks for the heads-up Lakesh. I've corrected the error which caused the Deck Builder to return an error when you attempted to import your Character Profile to it. The error was caused by an error-catcher I've added to the Deck Builder, so if the code was unreadable it will abort the import, post an error instead and load the Deck Builder normally. Turns out the maximum amount of valid ability clusters had been set to 74 rather than 75, so people with any points spend in Turbulence would get an error. I'm terrible sorry! The error was on the server and not with the add-on, so no update is required. If the error still occurs you should simply refresh (F5) the page to reload Deck Builder. I'm using the Slayer Deck (Illuminati) most of the time. When my Chronicles page displayed it (the Slayer Build) i got a incomplete Import when i tried to use the import feature of the Deckbuilder. At the moment my Chronicles page displays a different Build, and i can use the import function of the Deckbuilder, so i guess the problem is somewhat related to a abilities used in the Slayer Deck. Because changing my Build does not change the Character Profile url. Well i did get a incomplete import using the import funktion from the Deckbuilder website prior to today. But the url provided by the ingame addon under Char. Profile still ends in an error. ps. Thank you for creating the Deckbuilder, it is a great help. pps. maybe the two problems are unrelated ... i will try to log out with the slayer build again so i can see if it will bug the Import in your Deckbuilder. I post my code into google chrome and all I get is "invalid url" once your site loads. Could you post the example of the code the add-on exports to you, so I can debug it and see what might cause this error?